but the email was fab. Now you see why I wasn't invited to join the creative writing program in college! But the point to be made is that this past year e-mail became multimedia, and this surfaced in, among other things, the digital postcard which shipped in force during the last holiday season. This year, along with my typical e-mail and snail-mail offerings, I found my digital mailbox stuffed with colorful, tasteful digital cards of all shapes and sizes (see Figure 1). And these are not just for holidays. Birthdays, anniversaries, condolences, and other occasions of merriment and distress, are all subjects of these online postcards. Several servers exist which, for the opportunity to advertise, will do your bidding. This imaginative use of cybermedia would have no downside were it not for the bandwidth demands. Figure 1. 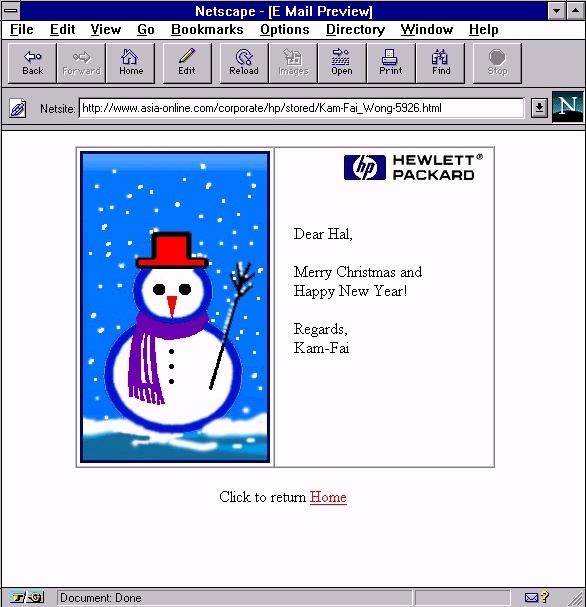 A typical digital greetings card as rendered through a Web browser. The card itself is stored on a server. The URL to that card is a "hot link" in a regular e-mail transmission. Of course, sending personalized greeting cards via e-mail is as old as e-mail. I still withdraw an occasional morsel from my collection called "ASCII-lover's delight" for distribution to my closest pals (see Figure 2). This is a time-honored tradition within my digital family. Though less than vibrant multimedia, the thought still comes through. Figure 2. ASCII Lover's Delight. 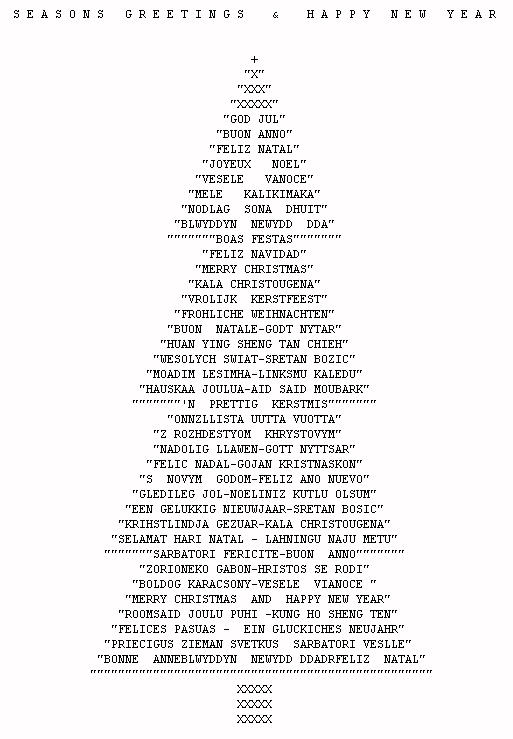 One of many pieces in the ASCII collection of my virtual, digital museum (read that: .TXT files which litter my hard drive). To be sure, it was possible to get a bit more fancy by using multimedia e-mail attachments. However, there are two obstacles to widespread acceptance for greeting card purposes. First, there is an wide range of attachment formats (MIME, uu-encode, etc.) which different users elect to enable or disable at whim. This ensures that the likelihood that the multimedia attachment will get through is nearly random. Second, there is considerable development effort involved. Someone has to assemble and format the artwork with a graphics program prior to inclusion as an attachment - anything but no muss, no fuss. The secret to the current digital greeting card nirvana was the placement in 1996 of mini-launchpads in e-mail clients. With the launchpad in place, a double click on a highlighted URL within an e-mail message spawns a Web browser which then loads the document. That's what produced the card in Figure 1. The initial e-mail message also provides an access code and password. The digital cards remain on the server for a week or two. The actual operation of the server is remarkable for it's simplicity, if not efficiency. A server-side program uses CGI- forms to gather information about the sender and recipient, as well as the imagery and message. On submission, the program composes and sends the e-mail alert to the recipient while it integrates the text and graphics into the single image of the card. The card is then stored as an HTML document with its own identifying URL which becomes the link on the email. The present systems seem a bit pretentious in design, requiring authentication of recipients. For the life of me I can't imagine the need for that level of security for something as inconsequential as a digital greeting card. Several such services exist. Figure 1 came from one of Hewlett- Packard's "Create-a-Date" servers - this one available through Asia Online at http://www.asia-online.com/corporate/hp/. This is really a useful service for HP, since they customize the graphics for their own family of DeskJet printers. One may print directly from the Web browser without intermediate formatting. Two folds later and the 8.5" x 11" paper becomes a personalized greeting card - with the HP logo centered at the bottom of the back page, exactly as if one bought the card from a stationer. A similar service, but with a much wider range of artwork, is provided by the MIT Multimedia Center at http://postcards.www.media.mit.edu/Postcards. It works essentially the same way as "Create-a-Date". Look for many more of these digital postcard services in the future as advertisers rush to this new form of cheap advertising as moths to flame. Think of it - a few thousand dollars to set up the server, and the customers print out your advertising logo on their own paper. This is a bonanza too important to ignore. On the positive side, think of all of the postal persons who will no longer have to push themselves through the snow drifts, bag-on-back, to deliver those weighty Hallmarks. Ok, so they drive little trucks and don't work on holidays anyway - but think of the fuel saved!